Hey there, are you a smartypants? Do you want to prove it? We meet every Tuesday at 7pm at the venue 1867 Bar. We have a 2 Hour Pub Quiz that is 8 Rounds of 8 Questions. We do music, movies, pup culture, science, and other geeky exploits. You can have a Team of 6, so bring a variety of friends to increase your chance of dominance. Oh, and did we mention it’s FREE. NO COVER, ALL PRIZES. .
Want hints? Exclusive info? Join the group! Do you like prizes? We love giving them away! Make your Tuesday so much more fun with real moneyfied prizes! Come for the Drink Specials! Kelsey has a wonderful venue, and our bartenders are awesome! 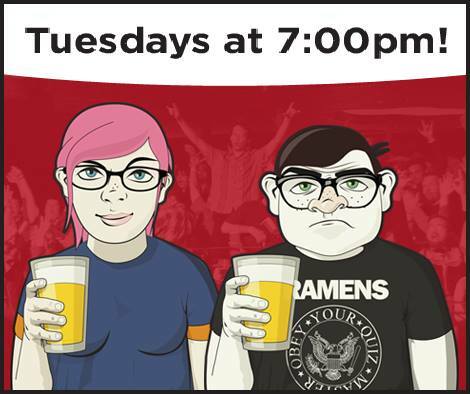 Every Tuesday night we are in search of those beer-loving know-it-alls for some (mostly) friendly competition. Bring yourself or your crew of brainiacs to take on the other geeks in a team-based pub battle royale featuring trending topics or old classics. We can’t give away all of our secrets. Challenge the office know it all, challenge that jerk that sits in front of you in class acting all smart and stuff, challenge your parents! See if they are really that smart. Challenge the stranger next to you in the Bar, or team up and tear up the competition. YOU walk away with prizes & bragging rights. You learn something, I always hate when that happens. OR the Quizmaster yells at you, which is all included in his good natured salty flavor. Infusion cocktails, Local Brews, Pets allowed, and some great people. See you Tuesday, geeks. Cheers!